I'm in Atlanta right now. My brother and I drove down yesterday in support of our South Carolina Gamecocks as they prepare to play the Auburn Tigers in the SEC Championship. I know the ACC Championship is taking place in Charlotte today--I wish a good time to all those fans. But there's nothing like the SEC right now when it comes to college football. The Georgia Dome, site of today's SEC Championship Game. The energy in Atlanta and our hotel is crazy with all the USC and Auburn fans around. The two schools are almost equal distance from Atlanta, so both are being represented heavily. But as far as I'm concerned, this is Gamecock Country! Some college classmates threw a "Welcome to Atlanta" party last night at 595 North Lounge. It felt like the Russell House parties and Club Y2K all over again (my USC alums from my era know what I'm talking about). There's an after-party tonight at Ten Pin at Atlantic Station (www.atlsecparty.com), that I hope turns into a victory celebration for us. I want to see the trophy make its way up I-20 East for its rightful place at Williams Brice! If you're in Atlanta and want to watch the game with USC fans, I suggest either Fox Sports Grill or Room Service Lounge. If you're in Columbia, there's an SEC Championship Game Watch Party at Colonial Life Arena. Doors open at 3 p.m., with free admission. Click here for more info. If you're in Charlotte, the Charlotte Gamecock Club is having a viewing party at The Tavern On Park, beginning at 3 p.m. Click here for more info. 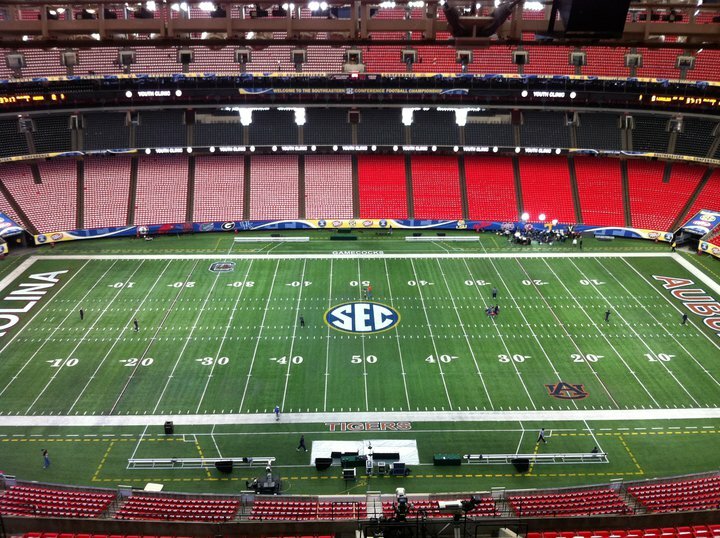 The game airs at 4 p.m. on CBS, live from the Georgia Dome.